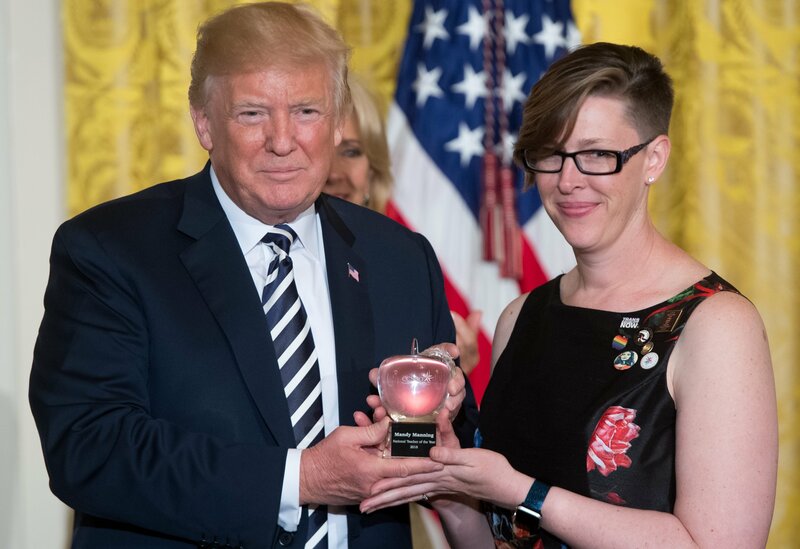 Months after being named National Teacher of the Year and meeting President Donald Trump, Mandy Manning will lead the charge in a nationwide protest of the administration’s policy of detaining undocumented immigrant children. Manning, who was named National Teacher of the Year in 2018, teaches English to newly arrived immigrants and refugees at a high school in Spokane, Washington. She co-created the group Teachers Against Child Detention (TACD), which serves as an alliance between teachers, educators, advocates and people concerned about children being detained by the government. The organization called on educators to act as mandatory reporters and demand the release of children who were in the government’s custody after being brought to America illegally. TACD also called for all detention centers that were housing the children to be closed. To ramp up efforts calling attention to the detention center, TACD will stage a “Teach-in for Freedom” on February 17. The protest will take place at the San Jacinto Plaza in El Paso, Texas, and will be broadcast live on Facebook, YouTube and other social media sites. "We are putting children into detention facilities across the nation simply because they were born outside the United States," Manning told The Inlander. "I know that's not something most people in the U.S. agree with." Although she’s still out of the classroom to fulfill her duties as Teacher of the Year, Manning told The Inlander that she most likely had students in her classroom who in a different time would have been placed in a detention facility. Among the protesters' demands are that the children in the government’s custody never be separated from their families, and that they be held in the least restrictive settings possible. The protest also called on the government to not house children in large facilities, and for the children to be released to their sponsors within 20 days. The issue of border security and the handling of undocumented immigrants has sparked differing opinions among Democrats and Republicans, but Manning said the child detention centers shouldn’t be a political issue. "I would hope that people wouldn't see locking up children as 'Republican' or 'Democrat,'" Manning told The Inlander. "These are children, and I'm a teacher." During the February 17 protest, a teacher from each state will share a lesson on a number of topics, including why people left their home countries and how Americans can welcome them legally. This isn’t the first time Manning is taking a public stand in support of children who came to America to escape harrowing situations. After meeting Trump at the White House ceremony, she gave the president letters written by the refugee and immigrant children she teaches. "I just had a very, very brief moment, so I made it clear that the students that I teach…are dedicated and focused," Manning said. "They make the United States the beautiful place that it is." During the ceremony, the president praised Manning for playing a “vital role” in the well-being of children in America, community strength and the success of the nation.